A derisive interpretation of Gabriel Kuri’s work seems to make sense: coming in out of the Berlin cold to endorse an economy of objects, substantiated by their ‘showroom’ housing and the artist’s wry manipulation of form and artefact. As the title, space made to measure object, made to measure space, suggests, a number of works have been made to fit the gallery, highlighting their instant aptness, while ridiculing the dysfunctional nature of 21st century ‘products’ and their disposable life spans. The temporal nature of ‘the exhibition’, aside from its duration, is exploited by Kuri and successfully turned on its head. With this selection of new sculptural works he presents premature artefacts; proposing that the measure of time in units be replaced by the fluctuating perpetuation of product through purchase. 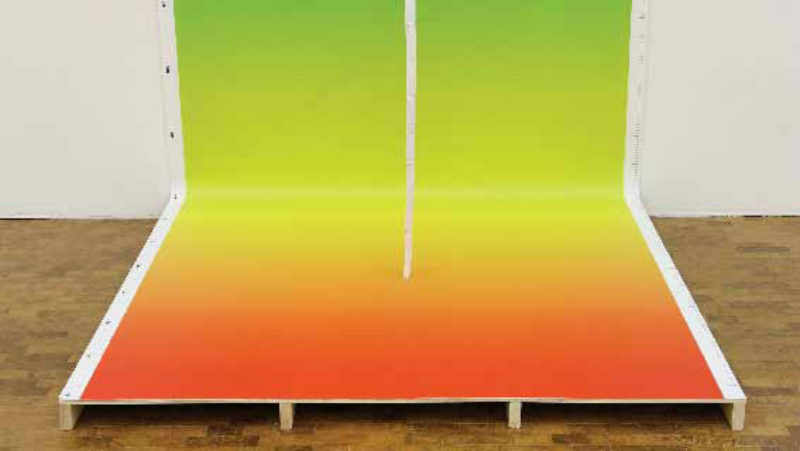 The most dominating work, ‘An immediate indexation of possibilities as a consummation of all desire’, 2007, (a colour spectrum that stretches from floor to ceiling, branded along its edge with corporate logos, toped and tailed by two pallets and wedged in place with a long, straight, white, bamboo cane) is characteristic of Kuri’s work. A flip/flop between instant gratification—through consumer references, and a quiet inquisitiveness that requires a deeper, deliberately dissembling, understanding. His commentary on the immediacies of the culture he works with and within are reflected in the shallow aesthetic nature of the work, while its critical complexities are evasively, but intentionally, withheld from the viewer. Kuri references, and amalgamates three different types of process—industrial, handmade, and organic—and these remain constant throughout the exhibition, best exemplified in ‘An immediate indexation of possibilities…’ but subtly explored in the work sited at the base of the opposing wall. ‘Quarry cast between a given corner and three random items’, is a post-historic action that embeds two Vans trainers along with a fragile cardboard box, its yellow contents and some tape in rock, exploring elements of the theatrical, with his ‘set piece’ attempting to derail common perception. This posthumous trickery is most explicit in ‘A calculated journey into a calculated experience’, 2007, where reproduction party foods rest on a makeshift cardboard table. Kuri successfully pre-empts both social and sculptural expectations in a double entendre of fakery. Again, this work highlights the lifespan of ‘the product’; the plates are partially packaged (but in use) and the makeshift table is undoubtedly a home-assembly table, still in its box. In the back room, ‘Upside Down Horizontal Line’, 2007, the most figurative work, rolls out on a white photographic backdrop that fills the space. In an elaboration of previous works, IKEA wastepaper baskets act as ironic containers for fragile plants and strips of plastic, while the backdrop nests them collectively in a similar irony. Kuri’s leftfield humour, paradoxically, is a social response, that is as timely and self-aware as his work. This humour, however temporal, is outplaced by an effective combination of commercial and natural objects, at times poetic, greatly symbolic; pulling his work away from the clichés of hollow 21st century capitalist criticism.